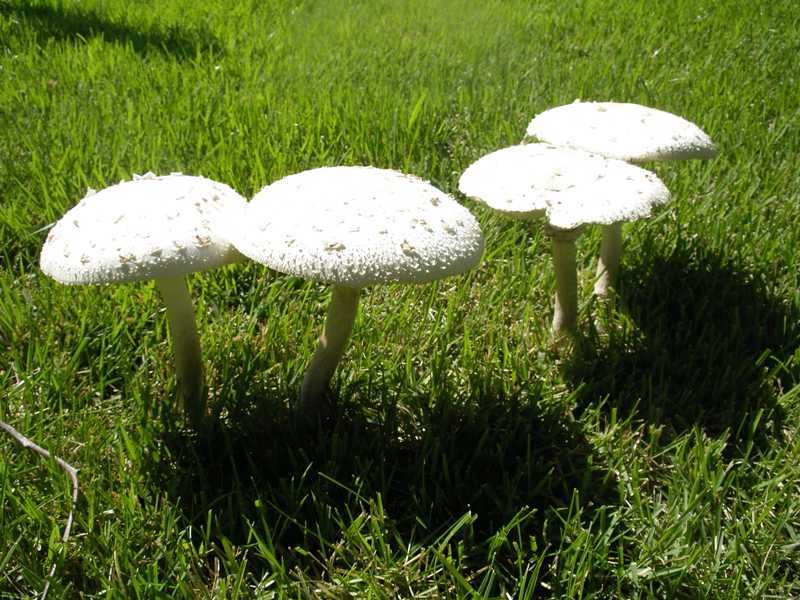 Mushrooms growing in lawns are common occurrences especially during rainy weather. They live off decaying organic matter in the soil, often decaying tree roots, and are not harmful to the lawn. They will naturally disappear as they age or they may be collected and composted, knocked down with a rake or hoe, or mowed over with your lawnmower. Mushrooms should never be collected and eaten unless you are expert in their identification. To the novice gardener, many poisonous mushrooms can look very similar to edible ones. Don’t take a chance. 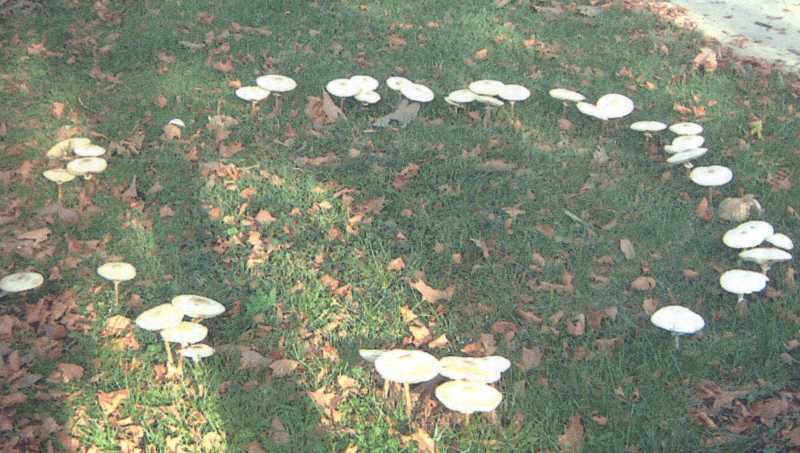 Mushrooms that develop in a ring in the lawn are called fairy rings. They will be the focus of the remainder of this sheet. Fairy rings are caused by many different soilinhabiting fungi of the class Basidiomycetes. These fungi can cause the development of rings or arcs of deep green grass as well as unthrifty or dead grass. Fairy ring fungi do not attack grass directly, but break down organic matter in the soil. As a result, nitrogen is released which the grass uses, causing it to grow and develop a contrasting green ring. In cases where the mycelia of the fungus get very dense and inhibit water movement into the soil, grass in the arc may turn brown. Mycelia may also deplete soil nutrients and produce toxic levels of hydrogen cyanide. The mushrooms that appear after rainfall are the fruiting bodies of the fungus. The organic matter fairy rings break down is often old tree stumps, roots, logs, lumber, and other larger pieces of organic material in the soil below the lawn. Once this material is depleted, the fairy ring will disappear. This may take considerable time. Several fairy rings may appear relatively close together, especially on lawns that exist on sites that were previously wooded areas. When this occurs, it becomes noticeable that fairy rings do not cross each other, as fungal activity ceases when fungi from different rings contact each other. Dark green circles, arcs, or rings of thick, fastgrowing grass develop anytime from green-up in the spring (most common) until the first hard frost in the fall. These rings are most commonly between 2 and 15 feet in diameter, although they may be larger or smaller. 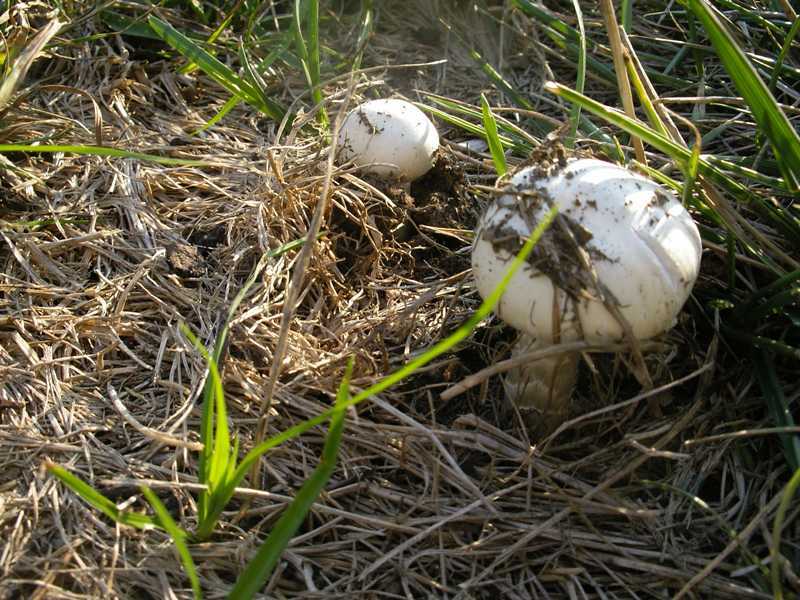 Mushrooms or puffballs may appear under wet conditions in the same ring pattern. In some cases, a ring of brown or dead grass may appear. Approximately 50 species of fungi are known to form fairy rings in turf, with Marasmius oreades, Agaricus campestris, Lycoperdon spp., and Scleroderma spp. being the most common. These fungi decompose organic debris in the soil and thatch. Fairy ring starts from a piece of mycelium or spore at a single point feeding in the thatch layer or on soil organic matter. The uniform outward growth of the fungus results in the development of rings. Under certain conditions, and with certain fairy ring fungi, a ring of dead grass develops. Some of the responsible fungi have been shown to penetrate and kill root cells resulting in dead rings of grass. In addition, the mycelia of some fairy ring fungi are reported to be hydrophobic, creating a waterimpervious layer resulting in drought-stress problems for the grass. Once the soil under this mycelial layer becomes dry, it is very difficult to wet, and the roots of the grass plant die. 1. Fertilizer. Use of a nitrogen fertilizer can mask the symptoms of fairy ring by causing the rest of the lawn to green up. Using a soil needle (deep root feeder) to aerate and irrigate dead and dying rings is recommended. 2. Removal. 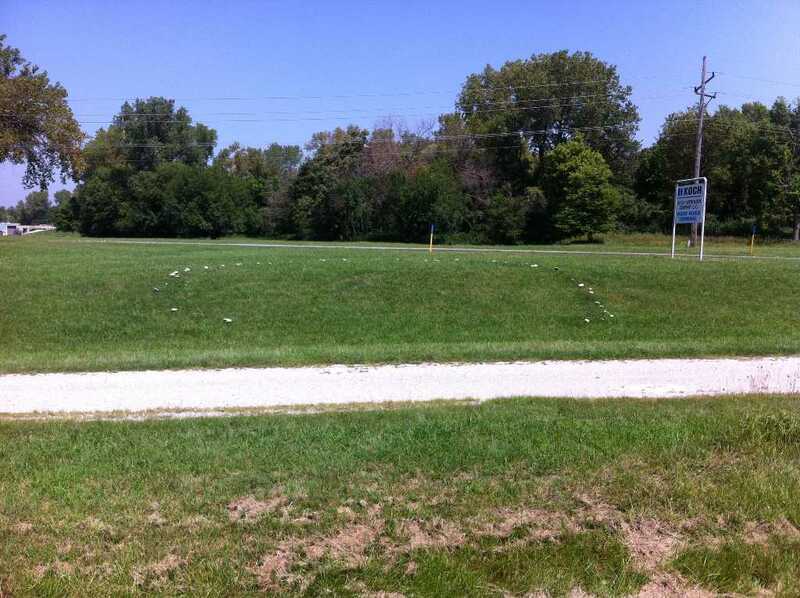 Fairy ring development can be traced to buried organic debris. Undecomposed tree roots, wood scraps from construction projects, and other organic debris are commonly colonized by the fairy ring fungi and should be removed before establishing a new lawn. Use clean, ring-free sod for a new or renovated lawn. Destroying existing turf may be required in persistent cases. Discard or kill a strip of sod 1 to 2 feet wide on each side of the zone of lush turf with a non-selective herbicide. Cultivate the area repeatedly to thoroughly mix the ring and nonring soil. Eliminate dry spots by soaking the cultivated area with water. Reseed or install clean, ring-free sod. 3. Thatch. Eliminate thatch buildup with a dethatching program. 4. Fungicides. Some fungicides are available for suppression of fairy ring, however, they may be only temporary as the decaying material may still be present. 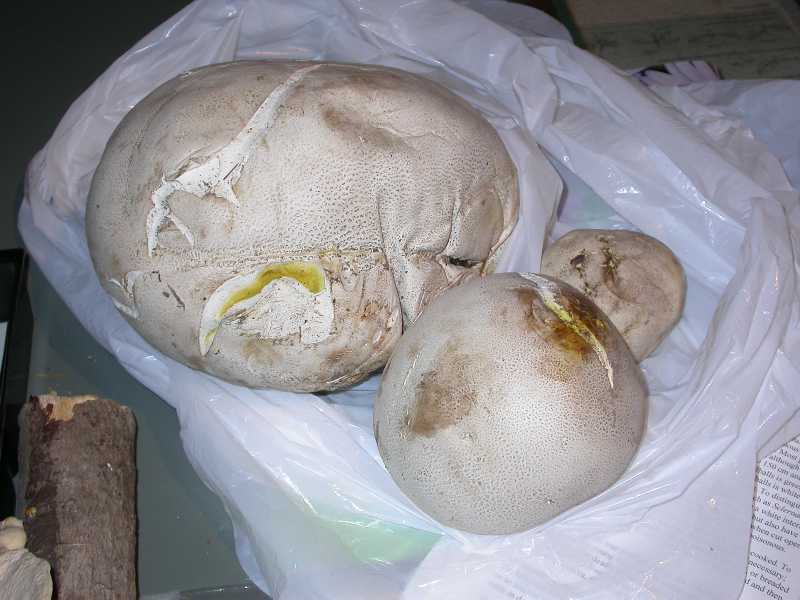 Puffball mushrooms of various sizes are often found in lawns or gardens but do not require treatment; they can either be ignored or raked up and discarded. False morel mushroom. Beware! This is POISONOUS. 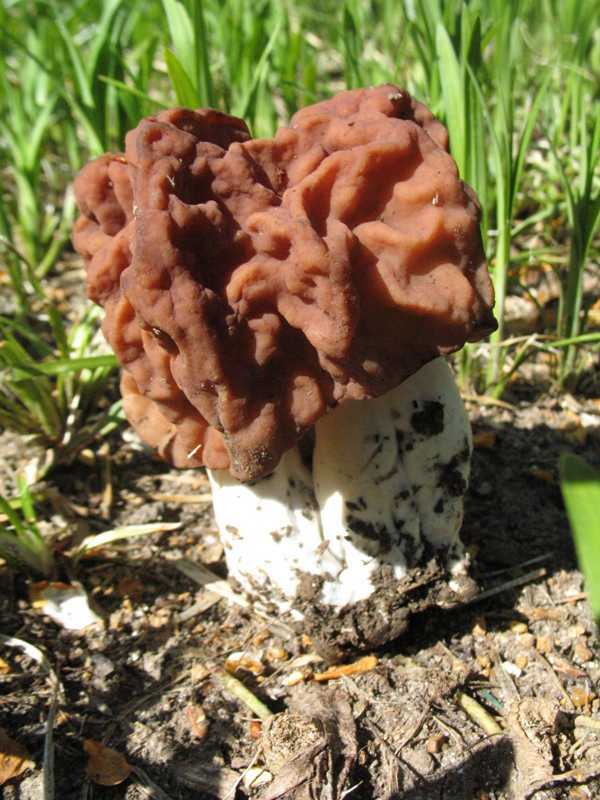 False morel mushroom. Beware! This is POISONOUS. 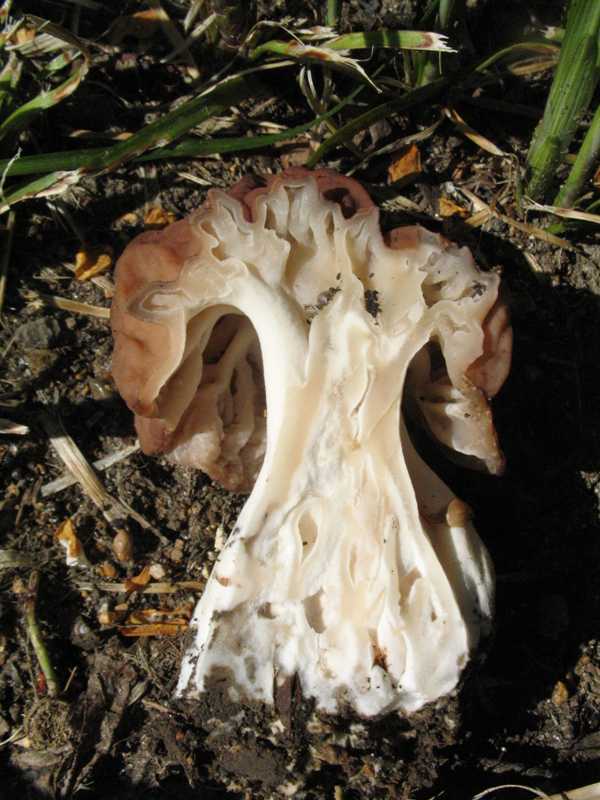 One identification clue is the solid stem (cottony interior); edible morels have completely hollow stems. Mushrooms are the fruiting bodies of fungi. Most feed on dead or dying organic matter, such as, dead grass. 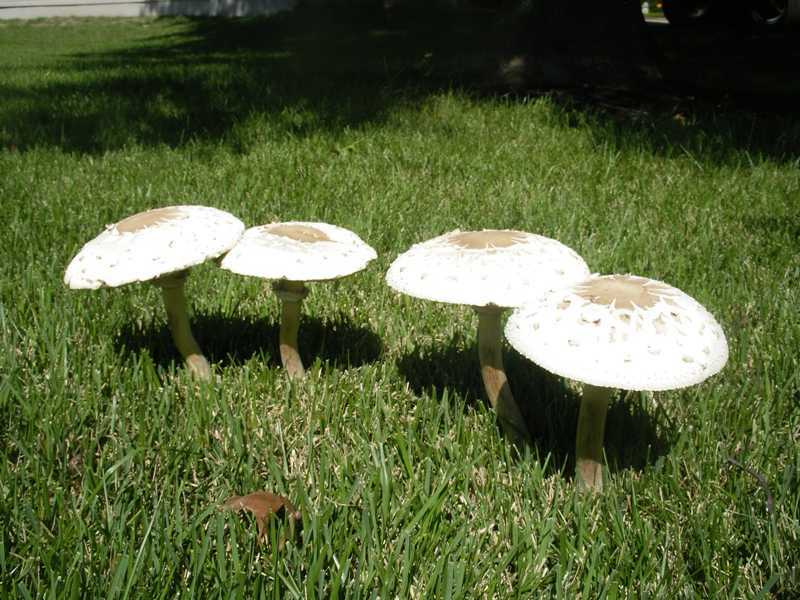 Most mushrooms in lawns are benign and can be raked up if unwanted.